The suit consists of a light-cream colored jumpsuit with light-gray padded panels. 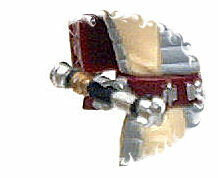 The rest of the gear like gloves, boots and the armored pieces are painted in a rich maroon color, providing a nice balance to the color scheme. The detailing is good in general. There are wrinkles in the proper places and the harder panels on the suit are clearly defined and sharp. In fact, were it not for the head, this figure might blend in without much problem within a realistic line up of figures. That last comment doesn’t imply that anything is wrong about the head sculpt, which is actually excellent, it’s only that it adheres closely to the CGI styling from the TV show. 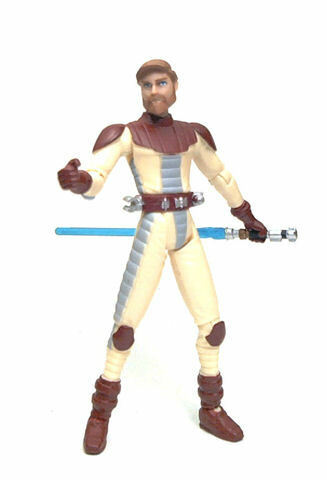 Even though we already had an Obi-Wan Kenobi in the first wave of Clone Wars figures, the head sculpt on this one reflects much better the character as seen in the show, which is reason enough for me to get this figure, along with the improved articulation. • Ball jointed neck. Excellent motion range, both tilting and swiveling. • Peg & hinge shoulders. Good motion range all around, although the sculpted shoulder pads limit somewhat the range to the sides. • Peg & hinge elbows. Excellent 90° bend, as well as sideways rotation on both arms. • Swivel wrists. More like glove cuts, but still provide free swiveling on both hands. • Swivel hips. Excellent motion range, allowing the legs to cover a 180° arc going back and forth. • Hinged Knees. The right knee bends close to 90°, but the left bends slightly less. Still a pretty decent range and both have unimpeded swiveling to the sides. • Peg & hinge ankles. Rather limited range but free 360° swivel on both. 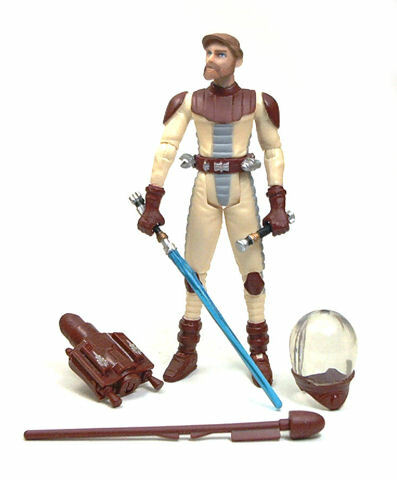 Obi-Wan Kenobi comes equipped with a blue lightsaber, a deactivated lightsaber hilt, a rocket pack and a clear-domed spacesuit helmet. Both lightsaber hilts are painted identically in black, silver and copper, and the deactivated hilt fits in a rubber clamp at the right side of the utility belt, although the orientation of the clamp is somewhat cumbersome if used in combination with the rocket pack. 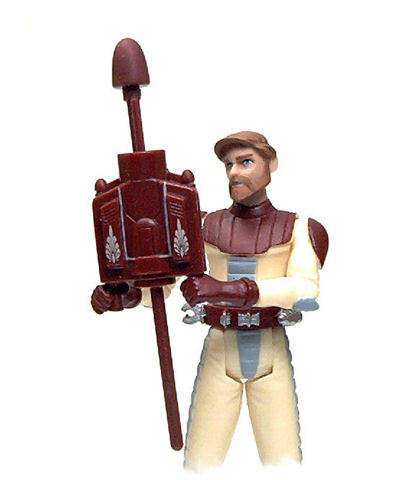 Like most of the Clone Wars figures, Spacesuit Obi-Wan has an action feature, this time in the form of a Missile Firing Rocket Pack. To shoot the provided projectile you have to pull the shaft of it through the hole atop of the pack to compress the inner spring and then let go to launch. If you prefer not to have the longer projectile on the figure (or you despise action features), you simply replace it with the provided plug. 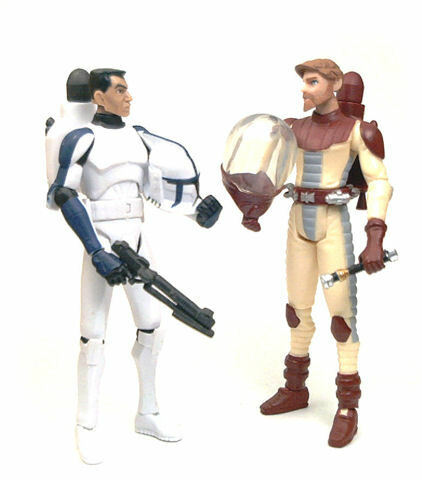 The rocket pack, missile and plug are molded in the same maroon plastic, unpainted except for a couple of Jedi Council crests stenciled in white at the back of the pack. 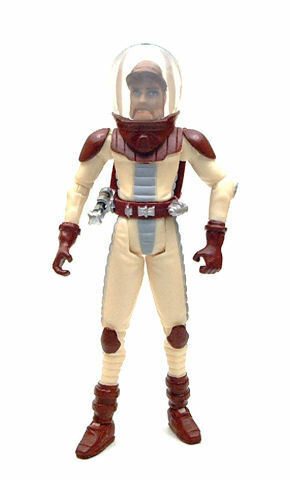 The fishbowl helmet is easily the most interesting piece of equipment, as it is made from a clear rubber-like material instead of the usual harder plastic used for such accessories, with only the connecting ring at it’s base painted in the same maroon hue as seen in the rest of the figure. The helmet fits flawlessly over Obi-Wan’s head and once it is on, it looks quite nice, even though there is a slightly weird fish-eye lens/magnifying glass effect that, coupled with the stylized look of the face, I find completely mesmerizing. Overall I love the retro look of the figure, and the fact that it is very well articulated is a definite advantage in my opinion. 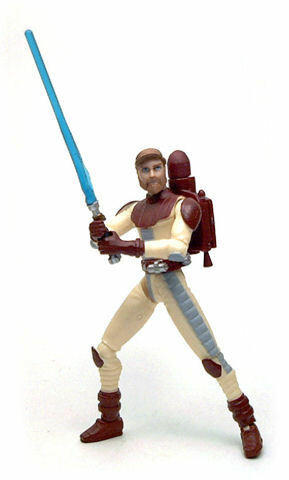 The only thing that would have made this a perfect figure is including some sort of retro-looking raygun, but nonetheless, this Obi-Wan scores pretty close to 100%. I’d love to seem somebody put a non-animated head on him and redo the paint in a bit more realistic fashion. Bet you’d end up with pretty much a Steampunk Obi-Wan. I think an alien head would work nicely too. The slim build would do nicely for a rodian.